When choosing front hub please remember what type of fork do you want to use it with. For example: if you have fork with 20mm axle (Downhill/Freeride or other gravity bikes) you must choose appropriate hub for it. Another options are: 15mm axle for Enduro/All Mountain bikes and 9 mm for typical XC/Marathon bikes. For BMX you may need 10 or 14 mm axle. Another issue is a drivetrain type: you can choose a hub with cassette or with a freewheel (single speed drive). At the top of each stage there is navigation panel, as shown below. If you want to change the selected product simply click on the appropriate stage in this panel. Number of spokes will be set automatically. Length of spokes will be chosen by the person making the wheel, so you do not have to worry about it. 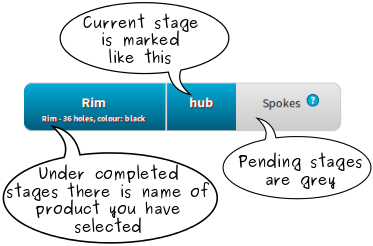 Be sure to choose products that fits together, eg number of holes should be equal in hub and rim. 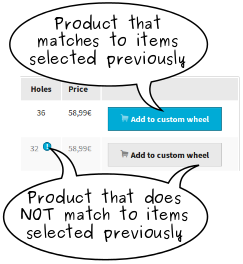 If you try to add product that does not match items selected before, warnings will appear, as shown below. You can add this kind of products but items previously added to configuration will be removed.